The iconic PriceWaterHouseCoopers (PwC) Tower in Midrand – Africa’s first twisted building – placed a number of unusual demands on concrete during its construction; AfriSam and CHRYSO Southern Africa delivered the concrete solutions. Concrete is the construction material of choice for twisted buildings, as it can create the desired twists and turns while providing the required structural strength. It also suits the stylistic intentions of these buildings, which are to achieve a more organic shape; looking more like a sculpture than a traditional block shape. Visible from a 30 km radius, the R1,5 billion PwC Tower will comprise 45 000 m2 of office space and house 3 500 employees. Apart from its unique design, the building is also required to contribute to environmental sustainability by consuming less energy and having a minimal impact on the environment. The biggest structural challenge was that the twist causes the gravity load to naturally create a clockwise torsional load on the building. To counteract this load, the designers Arup made unique use of parametric modelling software to establish the optimal solution. This solution comprises five structural columns on the façade of the building every five floors. The structural columns slope in a counter-clockwise direction around the core and span from floor to floor (3,74 metres in height and 750 mm in diameter). The concrete strengths of these columns range from 50 MPa (from the basement levels to level four) to 40 MPa at the mid-levels (level 5 to level 14) and 30 MPa at the higher levels (level 15 to level 26). Arup’s structural solution was aligned with the aesthetics of the façade design. The five structural columns along the slab edge resulted in a favourable perimeter span of eight metres; the decision to repeat the column series every five floors allowed the relationship between the columns and the façade units to remain constant. In other words, each of the 25 possible column positions relative to the slab edge align to the centre of a façade panel; if one follows any column up the elevation of the building, it will always be central to a façade panel at each floor. 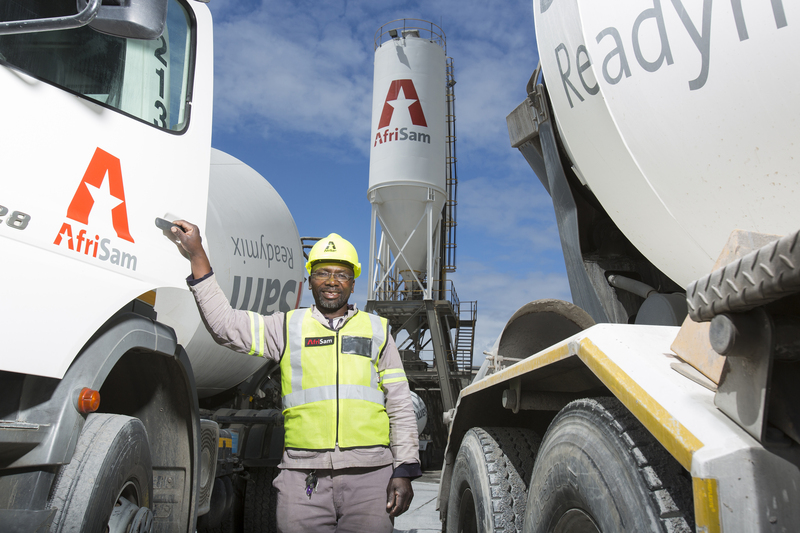 As the concrete supplier to this complex project, AfriSam designed 19 project-specific and special application mixes with an average ordinary Portland Cement replacement of about 30%. Also, each slide concrete mix had normal and retarded versions to satisfy the different applications; the trial mixes were produced at AfriSam’s Jukskei laboratory. Each of these mix designs used a unique eight digit code, specifically created for the PwC project in order to make sure that the correct concrete was ordered during each stage of the daily pour. Concrete was delivered from AfriSam’s Jukskei A dry readymix plant backed up by Jukskei B wet batch plant, both situated at the Jukskei Quarry in Midrand, close to the PwC Tower site. Both readymix plants have fully automated command batch computerisation, so it was possible to modify concrete designs remotely and at any time as the project demanded. Batch accuracy was within 1% on all materials batched, so there was no room for errors. The close proximity of the readymix plants to the site made the planning and deliveries to site more convenient. AfriSam’s Jukskei A Plant was the primary supply plant while its Jukskei B Plant acted as the back-up, allowing for concrete to be delivered to site around the clock. During certain construction phases, concrete was supplied 24 hours a day, with three readymix trucks on a permanent turnaround basis. These readymix trucks had the ability to efficiently mix the concrete at the Jukskei A plant and again on site. Due to the close proximity of the readymix plants to the PwC site, the batch load size and loading sequences were optimised at 2 m3 to make sure the mix was homogeneously mixed before it left the plant. The concrete slump was also maintained strictly at 180 mm from the plant. The building’s core wall, at a height of 118 metres and thickness of 450 mm, was constructed using an interesting method of construction – slip forming. This sliding methodology starts with the assembly of the sliding system at ground level. Concrete is poured continuously within shutters and the system is lifted incrementally as concrete is poured, creating a structure without joints. Reinforcing is then fixed into position as the slide progresses so as not to slow down the placement of concrete; over 400 tonnes of reinforcing was used in the core wall. Working continuously in two 12 hour shifts, the sliding team comprised at least 62 workers on the slide shutter itself at any one time. This allowed the core wall to be constructed in 65 days, with an average of 90 m3 of concrete placed per day. AfriSam had to design concrete mixes that were both pumpable and suitable for slip forming, including specialised retarded mixes that could be continuously pumped up into the moving slide around the clock. A static pump would pump the concrete into the slide cavities using a spreader that was fixed to the slide. Pumping vertically over 100 metres would mean possible high pump pressures and the need for lubrication within the lines had to be considered, and steps taken to avoid segregation and blockages. If the pumping pressure was too high, excessive pressure would be placed on the mix and this could force segregation of the concrete (water washing out of the paste) and cause blockages in the pipe. In addition to this, the pump would be started and stopped for extended periods when shuttering inserts and reinforcing had to be installed, with the pump and pipeline full of concrete. Another factor would be the continuous stop/starting action as the hose was lifted out of the reinforcing forest and inserted again into its next position; the reinforcement in the lift shafts would also be very dense. This highlighted the need for the concrete to remain workable for up to six hours, long enough for it to pass through the pipeline and be placed into the structure. A concrete non-return valve was used to prevent any backflow; opening and closing as the pump worked. AfriSam incorporated about 30% fly ash in the mixes to increase the pumpability and slow down the initial setting time. To achieve this, a combination of three CHRYSO additives was used including a superplasticiser and retarder which delays the setting time of the concrete. This provided enough time for concrete to be placed into the form, around the core wall, and vibrated so the sliding process could continue. The concrete would exit the bottom of the slide 10 to 12 hours after casting. It could not be allowed to harden during this time as this would reduce the ‘slip effect’ and make it difficult to incrementally lift the sliding system. The concrete supported the slide platform. AfriSam also paid particular attention to the aggregate grading and fines content. If the grading of the aggregates was incorrect, they could be pushed out during pumping and this would result in blockages in the pump or pipeline. When pumped, concrete moves in a cylinder and is separated from the pipeline wall by a lubricating layer of water, cement and fine aggregate or sand. This lubricating film is vital to achieve the necessary workability of the concrete so it can be pushed through this channel. The CHRYSO® Superplasticiser was therefore added by AfriSam; it is designed with the CHRYSO® Fill Free technology for a cohesive concrete paste which is less sticky, as stickiness can increase the resistance of the flow of the concrete in the pipeline. And will make it difficult to maintain a constant rate of pumping. It was important to achieve exactly the correct slump. The sliding process may be delayed if the slump is too high and it may be difficult to slide if the slump is too low. Since the CHRYSO® Plasticiser is a multi-dose admixture, it could create concrete with the best suited slump for the project. This admixture created a dense, cohesive concrete mix with sufficient paste volume that enabled the correct level of workability of the concrete. It also assisted with a good aggregate coating by dispersing the cement grains, thereby minimising agglomeration of the mix and increasing plasticity and therefore workability of the concrete. The 180 mm slump was achieved without any segregation of the mix. Any segregation of the mix would cause blockages as the slush is pushed through the coarse aggregates causing a plug. CHRYSO® Plasticiser also helped in creating a favourable water-cement ratio by reducing the amount of water, improving durability by preventing shrinking, cracking and porous concrete. The landmark PwC Tower now stands as testimony to the skill and innovation found in South Africa’s built environment disciplines, including the providers of cement, concrete and specialised chemical admixtures. A total of 6 057 m3 of concrete was used to construct the core wall. Concrete is normally placed using a bucket and crane; however, due to the large quantities of concrete involved, it was decided to pump the concrete vertically up to the height of 118 metres. When concrete was pumped to the top of the building, there was 3.5 m3 of concrete in the pipeline! What makes a twisted building so different? The Council on Tall Buildings and Urban Habitat defines a twisted building as one that progressively rotates its floor plates or its façade as it gains height. The PwC Tower twists both its façade and floor plates as well as the supporting structure, which is essentially a concrete frame with post-tensioned concrete floor plates. These twisted manipulations create a stunning variety of textures, view angles, and ripple effects.